There's a street I know where nothing ever changes. Of course, it must change. Indeed, I know it does because I went looking for prickly lettuce against a wall and it wasn't there. But somehow the seasons get left behind. There's very little rubbish but there are always autumn leaves. How can there be leaves when other things are swept away? It makes it a pleasant place to walk. The houses are strong and practical but not necessarily beautiful. There are pensioners' bungalows along one side; council houses on the other. Close by there's a well-kept green with a post-box. Around the corner there are lock-up garages. This is the street where the horse chestnut grows that went with the list of Tree Following posts for June. It's a plain and ordinary residential street - where leaves always stay in the kerb. Some must be taken away or the place would have silted up long ago and no-one would be able to pass in and out through their garden gates. And for whatever the reason, it's a sure fire place for street plants. Maybe they are protected by the leaves? But it seems more the other way round. The leaves are caught among the stems of the plants which grow there in profusion and variety. It's not as if there's something special about this street compared with the ones around. There are more pensioner's bungalows than in others but why would that make leaves stay? 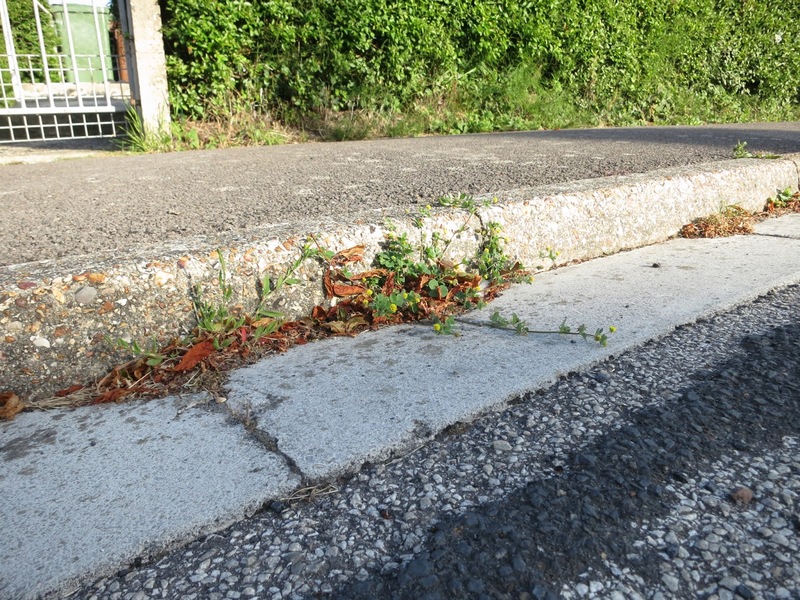 And it's not that older people are less likely to have cars to squash plants in the kerb. There are cars. What's more, some other streets have fewer because the houses there are provided with their own parking places. I can't fathom it. But what I do know is that I could have filled post after post after post with plants which grow in this one, ordinary, residential street where the wind and sweepers leave eaves and the elements provide the best place possible for an abundance of plants in the kerbs. You know the tree in a drain we visit from time to time? It's thriving still. This year it's filled the hole beneath the grid with leaves. Here's a new sprouting. Are there plants in the streets where you live? Or where you travel around? 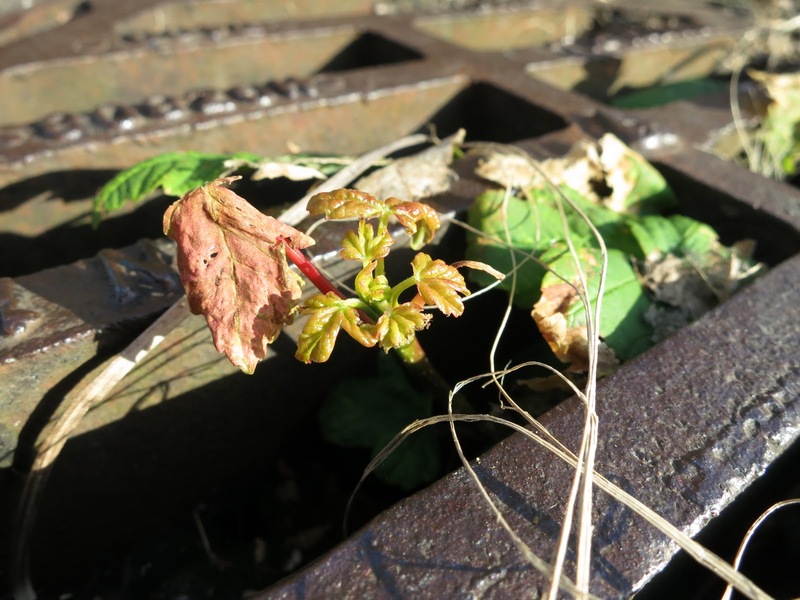 Do join us by putting your post in the Loose and Leafy Urban Wild Plant link box which will open tomorrow (21st June) and close June till 7pm on the 25th. For more info. 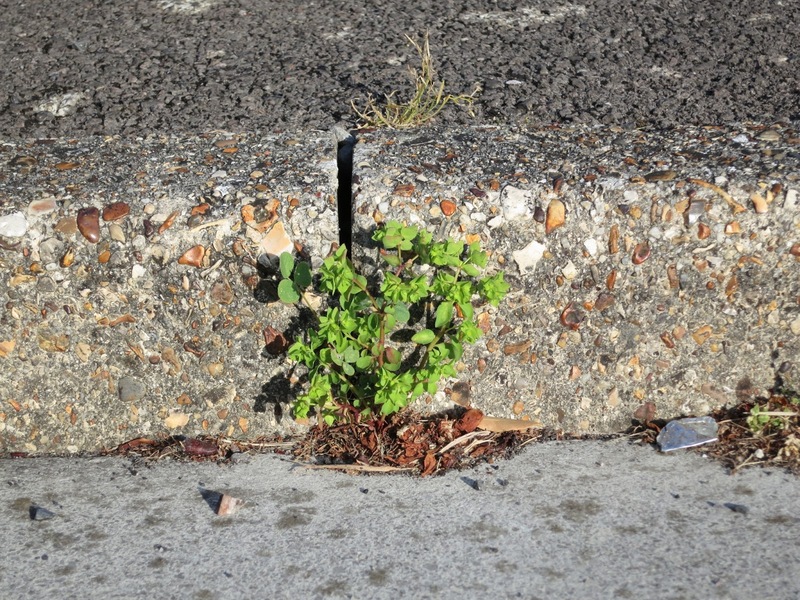 go to the Street Plant Bloggers Page. Do you know the Nature Gate site? I really do recommend it. It's elegant and informative. 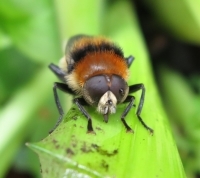 It's based in Finland but many of the plants and creatures on it can be found in other countries too. Here are it's entries for plants in this post. I have lots of that Spurge around my property. It grows in the road outside my house, but has also made its way into my garden, despite my efforts to eliminate it. 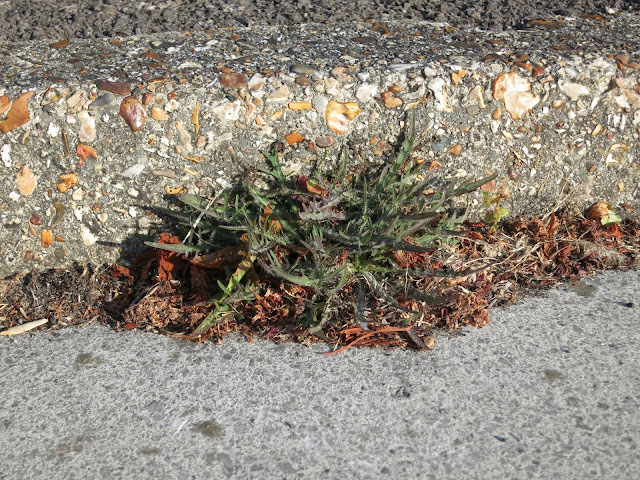 I think the street plants probably feed on the decaying leaves they trap in their own foliage - leaf-mould made in situ! Morning Mark. I find the petty spurge pretty. A rather good green and sort of frothy. In some parts of the world it's a sought after commodity because it's thought to have healing properties for some serious skin complaints but it doesn't grow everywhere. An interesting post Lucy. You're so good at naming your plants - I'm simply useless at that part of it. I can photograph the plants but when it comes to naming them ...! I've been playing with the "key" to plants at Nature Gate -- so cool!!! Makes so much more sense to specify everything we know about a plant and see what candidates we're left with. Pretty soon dichotomous keys will be a thing of the past ... and I won't be sad. 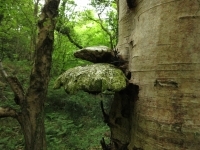 I always like to see the tree in the drain, thank you; and for the link to Nature's Gate. 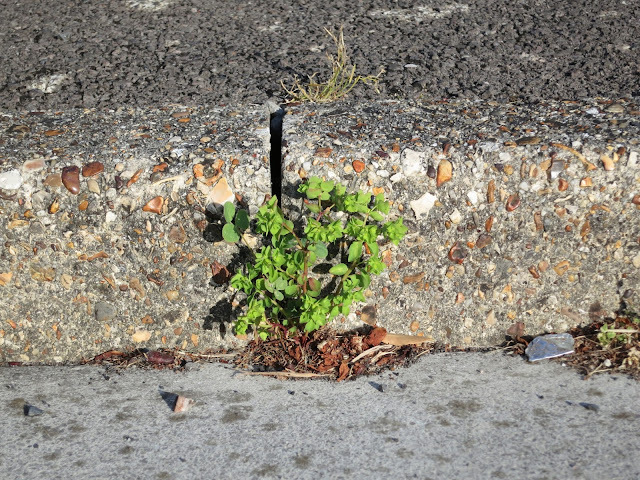 When ever Man moves out the plants start to take over again, it doesn't matter if its concrete, tarmac or buildings. Reassuring really! Hello Mike. The mystery (to me) is why more leaves stay in this street than in others even though it doesn't have more trees. In fact, it has fewer than many around it. Perhaps I should go back and examine the leaves more closely - maybe it's the horse-chestnut that's single handedly keeping up the supply. Hello Eileen. I'm glad I give the impression that I'm good at naming plants but the fact is quite otherwise. I would never have known what I do know without iSpot and being able to submit photos for identification. (Do you know iSpot? Everyone should join! http://www.ispotnature.org/communities/uk-and-ireland ) The other thing is that I come across the same varieties over and over so I know them . . . but come across anything new . . . and I'm off in a rush to iSpot. Hello Hollis and ToffeeApple. The NatureGate site is beautifully constructed isn't it. As well as it being helpful in identifying plants we have in common, it's awe inspiring to discover things we would not come across otherwise. Polar fritillary . . . POLAR fritillary! Apparently they don't know what the larvae eat but it might be Arctic white heather. I'm sure this is all very familiar to people in Finland but to me it seems exotic. Hello Barbara. So pleased you are joining us in looking for Street Plants. Hello Lyn. I'm pleased with the Shepherds Purse picture. The amount of time I've wasted on trying to photograph Shepherds Purse plants is extraordinary. The shape of its seed pouches is delightful but it rarely stays still. I have accumulated masses and masses and masses of blurry or wonky shepherds purse pictures over the years. This is one of the few in focus! Hello Brian. It is reassuring, isn't it. And the way you can be in an incredibly well-kept and built up area with not a plant anywhere . . . and someone opens a building site . . . and there they all are flocking along the link fences. (Hm. Perhaps I've just made them seem a bit too Triffid-like. Lucy, Most interesting to see how your mind and mind's eye work. You are finding interesting plants everywhere. Love it Jack.